Gold has been sliding to a $1196 low during early Asian session on the back of very late NY session comments from Fed's chair Powell who sent the Dollar to the 96 handle with a hawkish tone after a series of strong US data releases. US treasuries are back on highs making Gold unattractive to investors on top of the ease in geopolitical risks with the absence of the events. As expected Gold prices made their correction and back below the $1200 level. 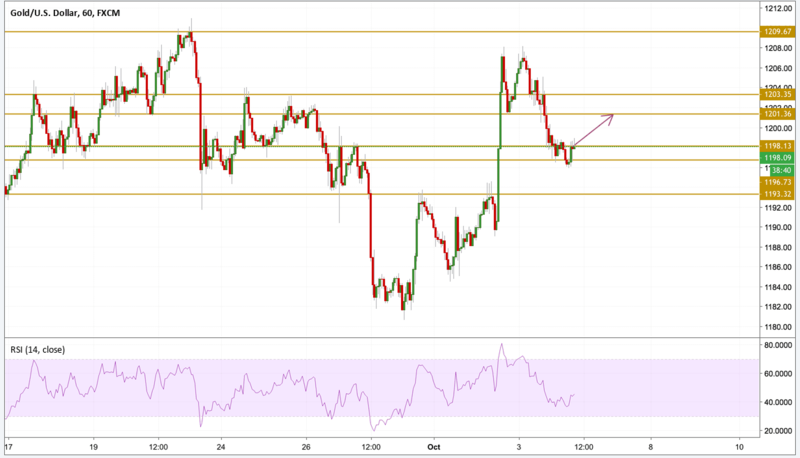 The price is currently hovering around the $1198 support level with the RSI showing a sign of a rising bullish momentum. A break above the $1200 level is more likely to happen and the level to be focused on is the $1201.4 level.